Ancient has come face to face with modern at a Bishopstoke location where 85 new properties are being built by Bovis Homes. As work begins on the new homes on the land near Eastleigh, archaeologists have returned to their laboratories to finish piecing together some of their finds following a nine week project at the site. Ian Hardman, Southern Regional Technical Director at Bovis Homes said: "Developing the land at Bishopstoke offered this opportunity for our contractors Prospect to explore the site before construction started, and we are delighted that they have unearthed some interesting artefacts that might otherwise have remained undiscovered. "These finds will hopefully help to tell future generations the story of how this piece of land changed over the centuries on the way to becoming the site for the modern homes we are building here today." 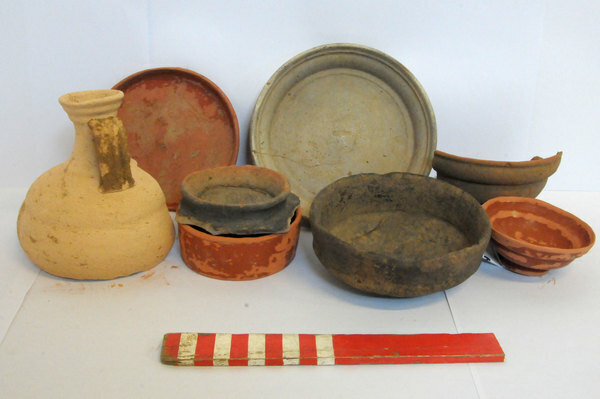 The pottery dates to the very early Roman period (from the 1st century AD) and some of the high status vessels are terra sigillata (Samian) wares imported from South Gaul (France). Other vessels found are handmade in forms typical of the late Iron Age and were probably produced locally. Naomi Field, Senior Archaeological Consultant at Prospect Archaeology Ltd, said: "This was a very interesting site and although initial evaluation had revealed a few ditches containing some pottery, the discovery at the bottom of the hill was a complete surprise. "We're delighted to have been invited by Bovis Homes to explore the site and preserve anything of significance before the new homes are built there." The excavation came after Bovis Homes were advised by the County Archaeologist that the site should be assessed for potential features of interest. Once the assessment had been carried out by CFA Archaeology Ltd, Bovis stripped the topsoil and prepared the site for the dig. Prospect Archaeology are now exploring opportunities to display the findings of the dig locally.